As an ADHDer, you probably find that your to do list often gets unruly. How many weeks has “clean the house” been on that list without getting done? It’s ok, no need to raise your hand– we’ve ALL been there. And once you get around to trying to clean it, how many times do you get started on one part of the house only to find that an hour has gone by and you’ve been in 50 different corners of the house cleaning and cleaning and organzing (or trying to anyway) but it actually looks messier than it did before you started? Yep. We’ve all been THERE, too. That would be a pretty thick guide and know us, we wouldn’t read it if it did exist. That’s ok though– There are blog posts. Like this one. Blog posts that give you bits of information at a time because you’re more likely to read a blog than an encyclopedia. What’s with ADHD and Not Finishing Projects? For most people, if you give them a list of things that need to get done, it’s fairly easy for them to decide what is most important or most urgent and adjust accordingly. For the ADHD brain, it’s a bit of an uphill battle. We’re generally fighting between prioritizing the wrong thing or trying to prioritize everything at once. The ADHD brain isn’t naturally inclined toward easily prioritizing tasks and time management the way most people are. We start cleaning the kitchen. We notice there’s a shoe in the kitche that needs to be put away in the closet. We get to the closet and realize we’ve been meaning to reorganize it for weeks! We start reorganizing when we notice that the pain on the door jam is really chipped. We head to the garage to get the paint and realize there’s recycling we forgot to put out for pick up. Before we know it an hour has gone by and nothing looks remotely better than it did before we started working. Why? Because the ADHD brain looked at every task that needed to be done, and couldn’t decide which one was more important so it assigned priority to whatever task hit the brain when it hit the brain. So we end up with multiple tasks that we start but never finish. Other times, we get really overwhelmed by how much we don’t wan to do some of the tasks that we should do so we instead prioritize the ones we want to do or the ones that are urgent because nothing is more motivating than realizing your inlaws will be at your house in 30 minutes and it’s a disaster but we didn’t get to it earlier because we were busy researching some obscure thing we’ve been totally obsessed with for the last few days. We pick want over should and urgently need over should. There is a lot to be said about helping an ADHDer learn to prioritize. Think of this post as more of a starting place than a comprehensive resource. More like a checklist and an encyclopedia. 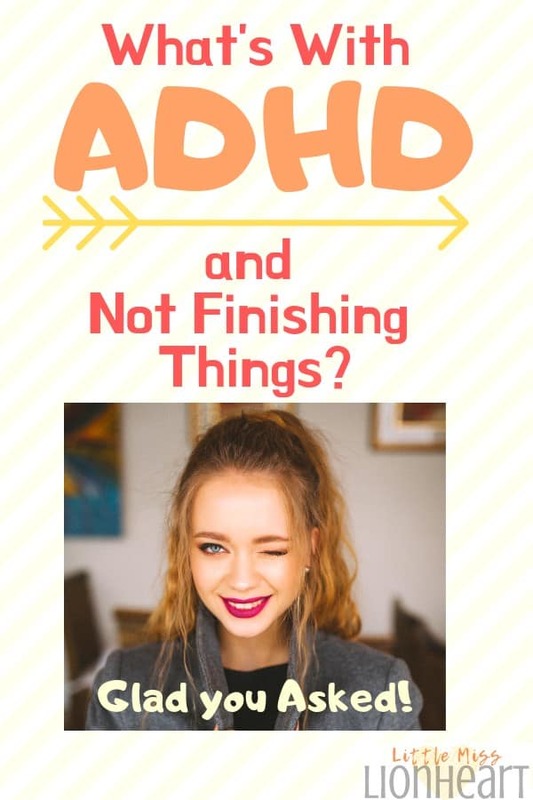 This “how to finish things with ADHD” guide is broken into 3 categories that I’ll walk you through: Creating and Understanding Your List, Organizing Your Schedule, and Strategies for Follow Through. Remember, overcoming some of the challenges ADHD presents is often done best with those extra, necessary supports that put us in a better place to use other strategies appropriately–supports like medication, quality sleep, an ADHD friendly diet, consistent exercise…you get the picture. This is where my list started. I tried not to talk myself out of adding things because they were “to-do list” worthy. Did I need to remind myself to play with the dogs? No, but it came to me so I put it on the list. Don’t overthink. You will organize your list in the next steps. Once you’ve got everything you need to do out of your head and on to your list, we start organizing our list. I start by asking some important questions. When am I most likely to actually do the task? Day/time of day, anything relevant. So, from my list, lets take a few examples for clarity. Most likely to get done: A morning at a coffee shop. Consequences: Bad. VERY bad. Don’t even want to think about it. During Netflix: No. Too hard to focus. Once you’ve got all of this down, we move on to organizing. This is where I start actually putting it into my calendar based on what I discovered. Now that I know my notes are most likely to happen during the middle of the day at a coffee shop, I look for a day before Thursday where I could get that done. Turns out Tuesday morning, I’ll already be at a coffee shop for a business meeting. It makes the most sense for me to stay after it’s over and get my notes done then. Writing a blog post is best done in the middle of the day as well. It won’t happen Tuesday so I’m going to tentatively plan for it to happen on Wednesday with a backup plan of Friday (if Wednesday doesn’t have as much time as I feel like it should). week, I do it Saturday. Then, I spend the rest of the day having fun. If, in the middle of planning out your week, you remember something that you forgot to put on your list, go back and add it. Then go through the questions with that task before you put it on your schedule. Writing it down helps keep it from feeling so overwhelming and minimizes the disruption in your focus. Let’s say tomorrow, I suddenly remember I have something due that I forgot. What’s a girl to do? Go back. Put it on her list. Walk it through the steps. Plan it on the calendar. If you have to readjust something, readjust them. When you find yourself working on something and then you get that impulse to go work on the other thing that’s also really important because you’re afriad you won’t get it done…it’s incredibly helpful to be able to remind yourself that the thing that’s really important already has a designated time it will be attended to. Life rarely, maybe never, works out the way we have on paper. Just count on that. You’re not likely to ever have a week that will work out exactly how you planned it. That’s ok. Adapt. Re-adjust. That’s what your ‘catch up’ day is for. So let’s say Tuesday morning I’m not able to get my notes done for whatever reason even though that’s when I had planned to do them. I’ll move it to Wednesday. It will replace my blog writing time which I’ve already duplicated on Friday anyway. If I find that I have overbooked myself and there are things I absolutely will not be able to get done, I go back and make sure all of my deadlines and tasks with big consequences are on my schedule and that I only take off the things that don’t fit those categories. What are the things that–if everything else on the list get’s accomplished–in the scheme of things, it’s ok that they didn’t get done? Are there any items on my list that would be best to just let go of and not worry about anymore? Are there ways to make some of the things on my list easier for me? I really want the pinterest stuff done and while there are SOME consequences if it doesn’t get done, it’s not the end of the world if it doesn’t. Bullet journal stuff is not a necessity–I keep a separate planner. If bullet journaling doesn’t happen it will be ok.
I’m not yet ready to say anything on my list is something I need to give up on but if my website speed continues to be satan incarnate I might have to give that up until a time I can devote more time to it. Making things easier on myself is definitely an area I can work on. I recently discovered that I can order groceries on line and have them delivered–that is going to help me ALOT. I also hate going to the bank and keep putting it off. I’m currently looking for a way to do what I need to do while avoiding the part I hate. We’ll see how that goes. Now you know how to plan your day with ADHD and you have a plan. A flexible plan, but a plan nonetheless. Now we move on to strategies to help you follow through. I glossed over one important strategy above that deserves to be pointed out more specifically. One of the questions I had you ask yourself is if there were any supports or times of day that make your task more interesting or at least more tolerable. It turns out, that’s a key to staying on task. I really hate writing my notes but when I asked myself “What do I need in order to not hate writing my notes?” It turns out the answer was a coffee shop. For whatever reason, it really does help. So now, I mostly write my notes at a coffee shop. I still have some time before I have to get everything done for my taxes but as I begin having to plan when I’ll be working on that, I’ll be asking myself this same question. If I were planning to work on them right now, the answer to what I need would probably be a set up that allows me to stand and move around, taking breaks to do something active (like cartwheels hehe), a fun snack and Starbucks. I’ll plan it for a mid day when I have plenty of time because once I get going, I don’t want to have to break my focus. There have been times that the answer was that I actually needed to plan the task for a different day. If it’s 10pm and I’m having trouble focusing and I was trying to do my taxes, the answer would be to plan it with fresh eyes at the earliest time I could satisfy the above needs before my deadline. Sometimes that’s your answer. Take a look at your to do list. Of the tasks you have, pick one that you feel the pull to procrastinate on and ask yourself what supports would make it more interesting or more bearable. I’ve started paying attention to the desire to put something off. Like, REALLY pay attention. I’ve discovered that there’s usually a reason other than just “it’s boring” though sometimes it is because it’s boring. I hate doing the dishes and I really put it off. I sat with the feeling of hating the dishes to try to figure out what it is I actually hate. It is, in part, because it’s a boring and stationary task, but that’s not the main reason I hate it. It turns out, I really hate my hands being wet and I hate when food gets on them and I hate the smell of the sink. Then, after I’m done, my hands still feel damp and my skin gets all wrinkled and makes me want to pick at the loose skin which leads to more open sores on my fingers. Pretty good reason to hate doing dishes. Now that I know why I hate it, I can try to put supports in place. I can have a really strong candle nearby to change the scent (or make sure my husband starts rinsing his dishes so it doesn’t smell as bad). I can’t change my hands getting wet or damp because I really hate wearing gloves but I can mitigate the skin problems I see by putting lotion on afterwards. I may also be able to overcome some of the dislike of my hands getting wet by researching if there are ways to use the fact that my hands are soaked in warm water to improve my skin and start trying that (because I am moderately interested in that). Jury’s still out on that one. I’ve been putting off working on my courses even though it’s something I’m really excited about. Couldn’t figure out why but when I started paying more attention to the desire to procrastinate, I discovered something else that’s been really helpful. I’ve been putting off the course work because there are elements of it that still feel very vague and confusing to me. It turns out I had tried to dive right in to creating a course, thinking that was step one, when step one was actually more like making a bullet list of all the things I think it would help people to know. I was trying to organize multiple courses as the first step and the first step was to figure out what the heck I wanted to be talking about. This helped me realize that sometimes we procrastinate because we’re totally overwhelmed thinking at we need to jump in at step 7 (because we assumed step 7 was step 1). And what we need is to go back and figure out what the actually first step is. So, you’re writing a paper and you’re avoiding it because the thought of sitting down to write it feels overwhelming. Paying more attention you realize it’s because you’re not actually read to sit down and write it. In fact, the first step is you have to review the assignment to make sure you’re actually clear on what you’re supposed to be doing. After that, you decide what you want to write about. Then you do some research. Then you plan your paper. THEN you write it. In other words, we’re procrastinating because we’re trying to jump to step 10 and that’s overwhelming…because it actually would be overwhelming if you haven’t completed the first 9 steps. Other times we are procrastinating because we are completely depleted energy wise and we really need some rejuvenation before we have to expend a bunch of mental energy on something we don’t want to do. Rewards often work better inverted for us. I don’t know about you but the concept of treating myself to my favorite lunch after I finish my taxes sounds nice but isn’t enough to get to actually want to do them. I think to myself I’m an adult. There’s nothing and no one stopping me from skipping straight to the reward if I want to so why not bypass the crappy thing I don’t want to do? Besides, even a great lunch isn’t enough to make me want to do taxes. Can you relate? It turns out, for us ADHDers, it’s actually better to set the reward up differently. Instead of doing the task THEN getting the reward, it’s often more effective for us to set it up as I’ll treat myself THEN do the task. It may have to do with the whole “low dopamine” thing. If you’re brain is low on dopamine, the concept of waiting to increase it with a reward until after you’ve done the thing that you need dopamine to be able to do doesn’t make a lot of sense, does it? If you find yourself unable to work on the thing that you planned to be doing in the moment and no matter what strategy you are using, you can’t bring yourself to do it, trade tasks. Do SOMETHING that’s on your list and put what you had been planning to do (but can’t bring yourself to do) on a different day. See if you can figure out what it is about this moment that prevents you from being able to do it so you can put strategies in place for the next time you try to do it then move on to a different task. It’s better to get something done than to stay stuck on the thing you can’t bring yourself to do and end up doing nothing. Lastly, use reminders if you struggle to remember your calendar plan. Experiment with an electronic vs. paper planner to see what works best. For me, I need paper. For some reason I have this weird thing where it feels like anything in my phone doesn’t really exist and I actually NEED to Write. Things. Down. Like, physically write them down in order to feel like they are concrete and organized. Many of us are like that and if you are that way but forget to look at a paper planner, then use a recurring alarm on your phone to remind you. If you do better with electronic calendars, setting alarms for things is a lot easier. Either way, experiment and go with whatever works. And regardless, consider using alarms because forgetfulness should be another word for ADHD, am I right? Half way kidding…kind of. I know this process seems like a lot of work, but it actually isn’t. The first time or two you try it, it may feel a bit time consuming but once you get used to it you start finding appropriate short cuts that don’t lessen the effectiveness and that helps. For many of us, the concept of taking time to plan like this seems like wasting more time that we don’t have. It felt that way to me at first and I had to work through the frustration arising that I was wasting time that I should be using to do the things that I was putting off. As I kept doing it, I realized that planning allowed me to feel so much calmer and more organized while making me waaaaaaay more productive. The difference has been huge. Needless to say, I don’t really get that “But I should be just doing it!” feeling anymore. 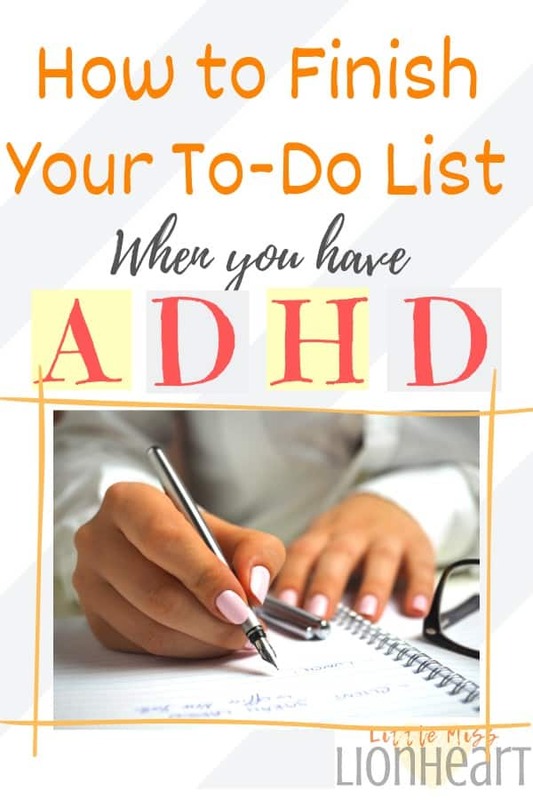 Learning how to get things done and stay on task with ADHD comes down to these steps: creating a detailed plan, organizing it in a way that works WITH your ADHD brain, and putting specific strategies in place that help you learn how to finish things with ADHD and actually finish them. We know that the ADHD brain works differently. Learning how to work with it starts with asking it what it needs and actually listening. Well, and of course the other stuff you just read about! Want more strategies for increasing motivation and becoming more productive with ADHD? I took this Udemy course written and produced by a mental health clinician who has both Autism and ADHD discussing practical ways that ADHDers can get things done with motivation to spare. Seriously, it was a fantastic course and the strategies I learned through it have been incredibly helpful in my personal life and those ADHDers that I work with. Sometimes Udemy runs a sale on it, which is awesome. I can tell you that it’s worth the sale price, it’s worth the regular price. It’s a great, hands on course with strategies you can start using immediately. Definitely Check it out. ADHD Focusing & Motivation Strategies. That Actually Work!